A communication platform developed by Google which includes messaging, video chat, and VOIP features. 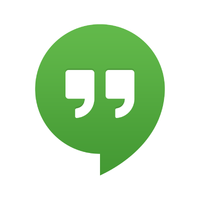 It replaces three messaging products that Google had implemented concurrently within its services, including Google Talk, Google+ Messenger, and Hangouts, a video chat system present within Google+. A telecommunications application that specializes in providing video chat and voice calls between computers, tablets, mobile devices, the Xbox One console, and smartwatches via the Internet. Skype also provides instant messaging services. Users may transmit text, video, audio and images. The leader in modern enterprise video communications, with an easy, reliable cloud platform for video and audio conferencing, collaboration, chat, and webinars across mobile devices, desktops, telephones, and room systems. Zoom Rooms is the original software-based conference room solution used around the world in board, conference, huddle, and training rooms, as well as executive offices and classrooms.